“Early in 1921, several hundred Americans were puzzled to discover an unsolicited package in their mail that contained a pair of books. (1) The larger of the two was bound in dark red cloth, and on the cover, framed by horizontal double lines, gilt lettering with a curlicued ‘M’ and ‘E’ lent a modest decorative touch. Roughly twelve inches in height, its size was typical for a volume of music, which the title, ‘Second Pianoforte Sonata,’ declared it to be. There was also a subtitle, ‘Concord, Mass., 1840-60,’ and for it the largest lettering on the sparse front cover had been reserved–larger even than for the names of the composer, Charles E. Ives. The second, smaller book, entitled Essays Before a Sonata, contained only prose, but it was attributed to the same Mr. Ives. The name was unfamiliar to all but a few of the recipients. Perhaps some of them thought they had received the books as targets of a marketing strategy devised by the ingenious minds of the rapidly growing advertising industry. 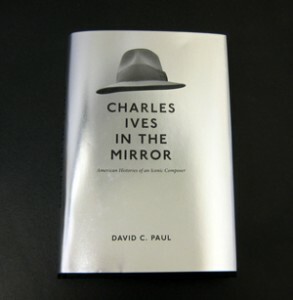 They would not have been far off the mark, for Mr. Ives, composer and author, was also responsible for some of the most successful advertising copy ever written in the insurance business.” Find out if the campaign by the insurance-adman-turned-composer was successful in Charles Ives in the Mirror by David C. Paul. This digital cover image created by the designer is good, but doesn't quite convey the same effect as old-fashioned paper printing with its blurry mirror effect.